Tulips are known for their beauty, popularity and being a favourite all year long. Today there are over 3000 varieties of cultivated tulips and a whopping 75 wild tulip species! Every year Holland grows and exports billions of tulips around the world. In this post, we are going to share some fun facts, and tell you how to care for your tulips, as fresh cut flowers and potted plants. Few know this, but in South Africa, Tulips are actually wintering flowers. They are rare in the warmer months of the year when they are grown in cold rooms. Worldwide they are the third most popular flower, only beaten by Roses and Chrysanthemum. They are the only cut flowers that grow in water! Tulips feel the drop in temperature at night and close their petals. The tulip’s petals are edible! Depending on the colour, they range from being sweet, to tasting a bit bland. PS. If you want to try this, the pink, white and peach petals are the sweetest, and the red and yellow the most flavourful. About 90% of South Africa’s tulips are exported. Tulip bulbs multiply when dormant. Tulips are one of few flowers that have pores along the stem that absorb water! If your tulip’s head flops to the side, simply pinch it through the neck with a needle or pin. The head will lift up soon after that and you might get an extra day or two of its beauty. Or, you can drop a coin in the water. The reaction from the water and the copper has the tulip lifting its head up again. First off, always buy tulips while they are still in bud. By the time you get home, they might have already opened, especially in the South African weather! The first thing to do with your cut tulips is to cut down the bottom of the stems as its pores have closed. When you cut the stems, you open the pores again for the stems to absorb the water. Once placed in a vase, only add about 5cm of water. Only top water up once a day. Don’t over water it, as it absorbs the water faster, causing the head to flop sooner. Fresh tulips don’t need plant food – it simply needs fresh water to stay alive. Fresh tulips are better on their own in a bouquet, as they only have a five-day life expectancy. REMEMBER: Tulips thrive in a cool environment as they are fragile. Spoil someone special with a beautiful tulip flowering plant or bouquet from NetFlorist. Tulip plants are grown in cold rooms in South Africa. Keep the plants away from heat as it causes faster development. Only water your plant twice a week. If you want, you can put water in a drip tray and place your tulip pot in there so it can absorb the water as needed. Once the colour of the tulip flower starts showing, the life expectancy of the tulip plant is around a week to a week and a half. Once the flower dies, you can cut it down and take the bulb out of the soil. Place it in a dry and dark place, or plant in a dry area in the garden. The bulbs multiply in the ground in their dormant state. In the late summer, you can plant your bulbs again for them to bloom during the winter season. 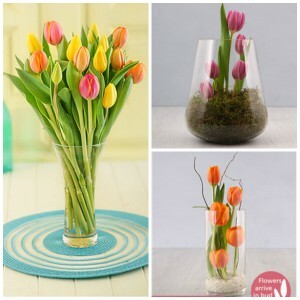 NetFlorist has the most amazing range of potted plants and flowering plants, like these beauties: Tulip flowers. Tulips are beautiful flowers and although they don’t have an exceptionally long lifespan, they are beauties you want in your home and office! 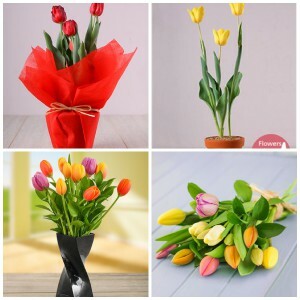 NetFlorist has tulips that come in just about every shade of colour and we know that these amazing flowers are an awesome gift for just about any and every occasion.